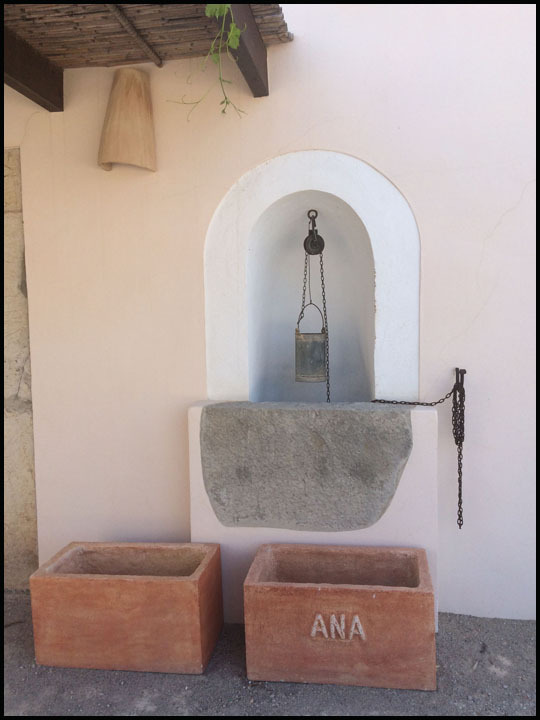 Celebrating the Mallorcan soil and unique local wine culture, Bodega ANA Vins specializes in native grapes, with northern varieties used in lesser percentages for structure and color. 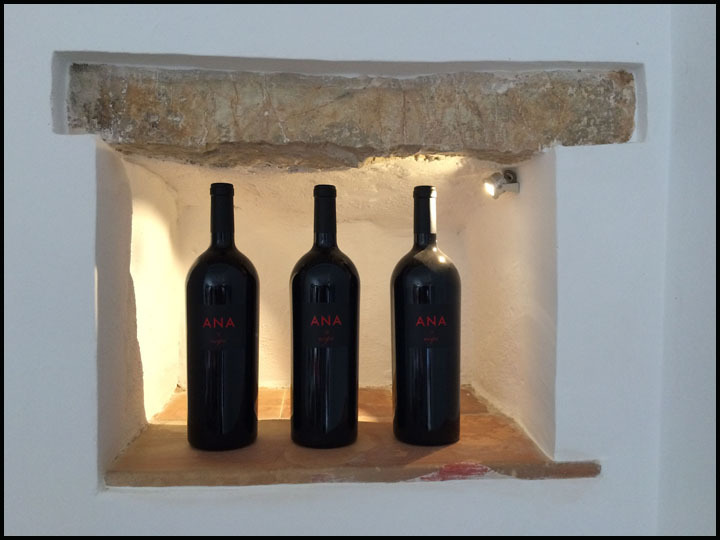 ANA is a young winery, started in 2010 with established, twenty year old vines. 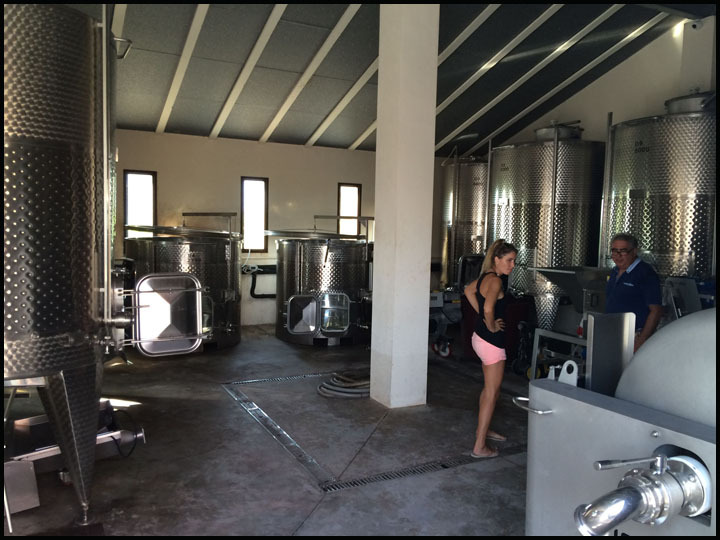 They now produce 55,000 to 57,000 bottles each year, mainly reds, and place great emphasis on giving the local varietals priority to capture the character of this island. They sell all they produce to their clientele on island, not aiming for an export market. ANA Vins is not part of the local D.O. Binissalem, but is part of the local organization Vi de la Terra. 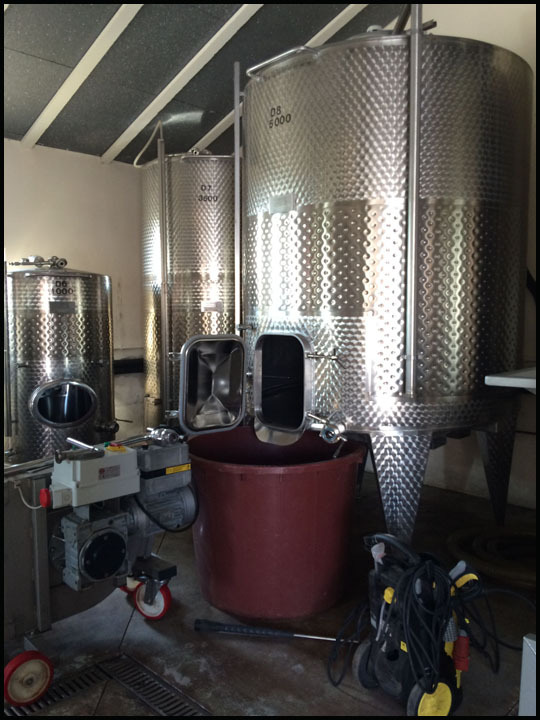 German owned and financed, they started this winery because of a love for the local wines and island! 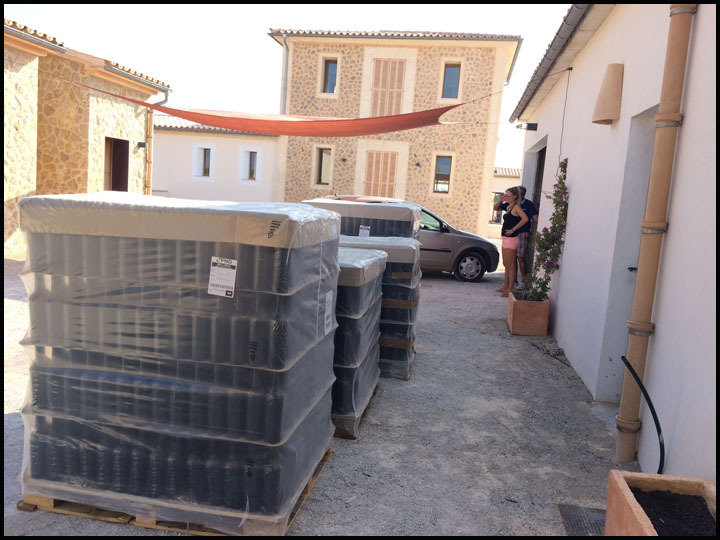 Surely over many good bottles of local wine, the owners brainstormed with Mallorcan Francisco Pol Arrom who is experienced in the local Hospitality industry, and a young oenologist Tomeo Llabres; and ANA Vins was born. Why is it always the end of the day on Friday in this Blog??? It must be when we do our best work! 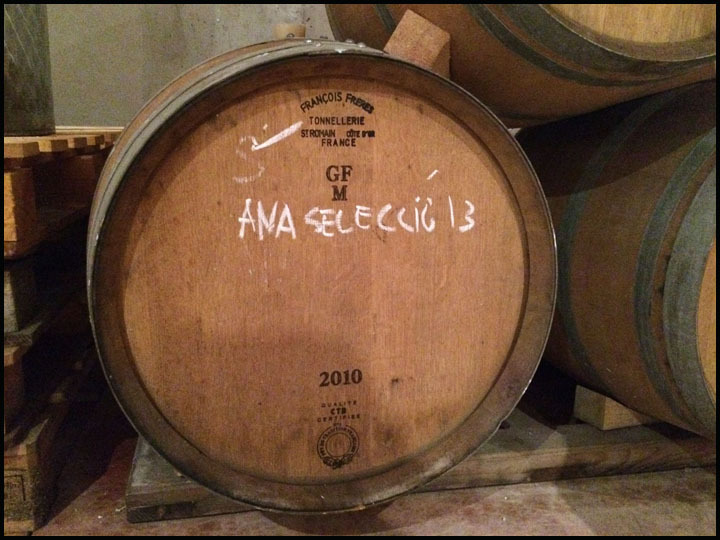 We were driving around in the area late Friday afternoon, on a lovely lane in the middle of the countryside just outside of Binissalem, and we came across the yellow marker of ANA Vins. So we called to see if we could visit, and the answer was SURE!! ; and an appointment made for 45 minutes from then. We drove through the vineyards as we approached newly constructed buildings set beautifully against their backing of vineyards and the Southern face of the Tramuntana mountains. Out popped a man’s head! Hello – we are here! It was the affable, knowledgeable, and multilingual Francisco Pol Arrom. He introduced himself as Xisco, and so it was! The three of us were sweating in the relentless heat, so we went straight to the cool tasting room for refreshment. Please see our tasting notes for facts, but of course we chatted while we tasted! Pouring their gorgeous, chilled Rosé, Xisco commented that at ANA Vins they are very particular with their maceration of each wine in order to get the exact color they desire. The display must be as appetizing as the aromas and flavors. Of course Rosé wines have a much shorter time in maceration than reds = sitting with their skins and seeds less time to catch only a flush of pink, and to avoid the level of tannins associated with good red structure. That, combined with the terroir of the limestone soil mixed with the local red earth (Call Vermell), make the unique attributes of a good Mallorcan wine. We found that their red Selecció wine improved as it opened in our glasses, so we did a little research on why wines like to breathe. Most reds improve with a little aeration, because as the oxygen reaches the freshly opened bottle, the wine naturally settles into its true flavors and the tannins mellow. The wine comes into its own, and shouldn’t be judged until it has breathed sufficiently. Some people just open the bottle and let it sit awhile, others use a wide mouth decanter to speed up the process, or wide mouth glasses and swirling the wine to aerate it quickly. We talked a bit about aroma vs taste consistencies. The ANA Vins Blanc barely had aroma, then tasted full and delicious. The Negre aromas were amazing, and it tasted really good, yet totally different from the scent. When we breathe in a wine and enjoy the aromas, we instinctively want the flavor to match it. It seems we must learn to enjoy the aromas for what they are, then on a separate subject, assess the flavors. Do vintners ever strive for homogeneous scent and flavor as an asset? As he poured, Xisco told us that ANA Vins prefers French oak. They find it rounder and fuller, and he said the American oak affects the tannins too much because the wood is younger – young oak is full of young tannins like young grape seeds. He also told us that they cut their first grapes in August, carefully looking for what is ready before September, the normal harvest season. After a very satisfying tasting, Xisco gave us the tour of the Winery. It was a ghost town at that hour on an early Friday evening, and fun to explore in the quiet. All was clean, new, and well organized. All production is done there on premise. It is beautifully laid out, from pressing to storage to barrel, bottling and labeling. The interesting thing that we noticed is that they efficiently store their bottles already packaged and boxed for the time that they age. The majority of the other bodegas we’ve seen store their bottles without label, and then clean and label before boxing and selling. We learned that Xisco is a man of many hats. He is the legs and heart of the bodega physically. We love to see such happiness in work. He told us the name ANA was chosen by one of the owners who has a daughter or a granddaughter named Ana; love the tradition of naming after the women! Xisco told us they also work with a Swiss chocolatier who combines chocolate with their wines – an experience we would like to try. We drove away happy and so enjoying this continued adventure. 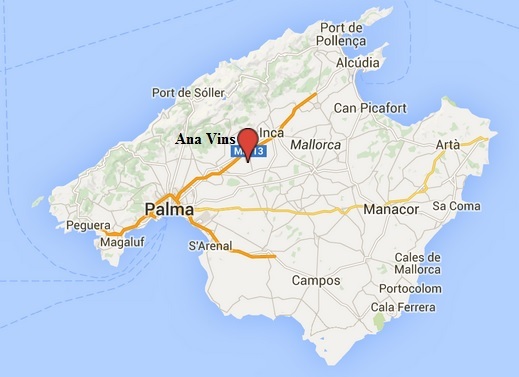 ANA Vins is a lovely winery with very good wines, and we do recommend it as a tasting destination on our MallorcaWine Trail! From Binissalem you take the road going towards Binali. There is a stop light at this intersection, so it is easier to notice. When you reach the Cami de Muro there will be a small white sign for this- it is the cross street. You will also see a yellow sign for ANA Vins. Take a right and follow for about 300m and there will be the bodega entrance on your right.